The plot shows the first principal component of the five series–a technique to summarize a bunch of related data series in a way that pulls out their common signal [update: earlier version said “principle” instead of “principal” but I was corrected by some big shot, persnickity, word maven of an economist] –in yearly changes since the 1980s. And the punchline is that there’s just no wage pressure to speak of. 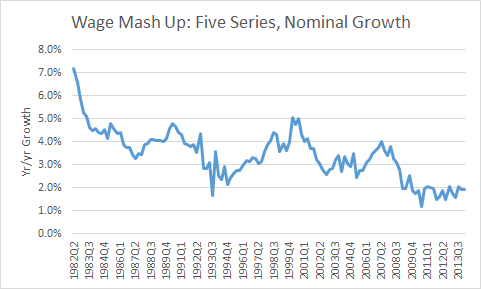 Growth rates of disparate series are all bumping at or near historical lows. This is a function of labor market slack and a reminder that including wage movements in the Fed’s dashboard is essential. Check that–given a) how little of the economy’s growth has reached wage earners, b) the importance of broad-based earnings in terms of robust consumer spending and a stronger recovery, and c) the idea that wage targeting may be more revealing vis-a-vis labor market slack than price targeting (as I show here, the core PCE has basically wiggled between one and two percent for over a decade! ; not so with nominal wages)–change “including wage movements” to “upweighting wage movements” in the dashboard. Sources: BLS, BEA, my analysis. Share the post "Wage Mash Up: No Pressure, No Matter How You Cook It"
8 comments in reply to "Wage Mash Up: No Pressure, No Matter How You Cook It"
Jared, This graph is a half court shot, all net. In the economics blagosphere, it is going viral. Great work. No one can resist the first principal component! Don’t be too hard on the Prof. Anyone who has to spend time grading student papers starts seeing mistakes everywhere without even looking for them. Basically, homophones are one of the worst things about the English language. It’s just pedants who get upset about these errors. They rarely reflect ignorance of the writer, just haste. But I did delight in having some fun at the expense of the great economist (and fine writer).